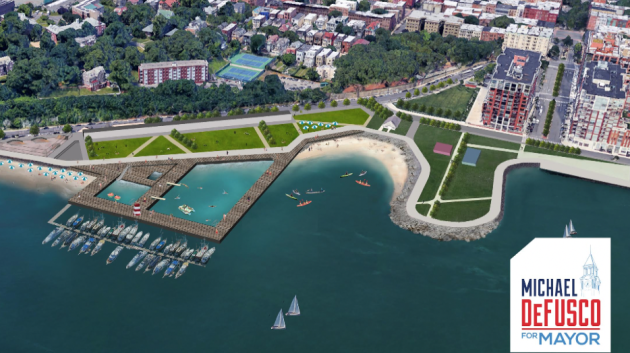 According to a story on the Hudson County View, Councilman Mike DeFusco plans to turn Hoboken's riverfront into a "floating pool and urban beach" if he's elected. The plan as envisioned is unclear if it will include a reunion of the Village People and Beach Blanket Bingo for seniors. The new beach line replacing the Hudson River in the imaginings of new energy from Councilman Mike DeFusco. Talking Ed Note: Just what Hoboken needs, a public place on the waterfront for urination from a bunch of bathers. Don't even ask where the money would come from for construction and maintenance of this summer sales job. Don't ask too many questions either. One Hoboken resident on Facebook yesterday noted he was blocked on a Mike DeFusco Facebook page after asking questions. Hey, don't ask questions, just write a comment on how wonderful the candidate is and move on. Hey, don't you know a lot of people from outside Hoboken invested a whole lot of money in the kid. You want to mess with their investment?